As you can see in the video I have implemented particle explosions. 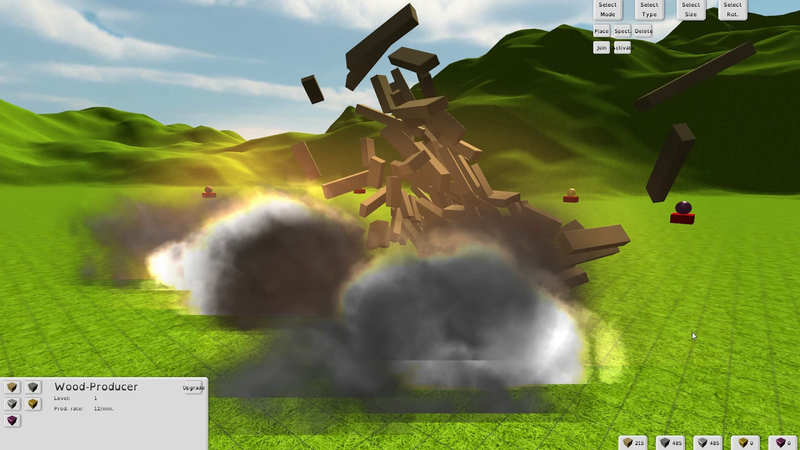 For that I used the free "Detonator" package for Unity which includes many different types of explosions. I chose one of them and tweaked it a little bit to fit into the game. I also disabled the force and used my own script instead because it gives me more control over the explosion. As I already mentioned before I was mainly working on the multiplayer last week because the rigidbody-objects (physics based blocks) created several problems. On one side it was very unstable and on the other the network-bandwidth consumption was way to high. So I sat down and thought about a new concept and started to implement it. I think I rewrote about half of the networking-code but it was worth it. A key part of the multi and also single player mode are the producers. I created a new menu on the bottom left corner in which you can upgrade them. I also changed the production rate and the costs of the blocks to get the game al little bit more balanced. So what can you expect to see in the next days? I'm not quite sure what I will do next but I will probably focus on getting the Free- and Inventor-Mode into the game. After that I will focus on making the game more beautiful by adding textures and more objects to the environment.